What to Do in Maryland, Virginia, West Virginia, and Washington D.C. While most schools in the United States remain in session throughout the month of May, there are still plenty of events and festivals happening in the Capital Region this time of year. Whether you're visiting Washington, D.C. or the surrounding communities in Maryland, Virginia, and West Virginia, there are plenty of things to do including annual celebrations, community engagement projects, and a variety of cultural performances and even parades. From the National Cathedral's annual flower market to Memorial Day weekend events and activities, add a little something extra to your vacation to the Capital Region this May by checking out these fantastic festivals. From April 27 through May 6, 2018, the 91st Annual Shenandoah Apple Blossom Festival will return to Winchester, Virginia to celebrate the blooming apple trees in the Shenandoah Valley. This annual homage to spring features more than 45 events including the Coronation of Queen Shenandoah, the Grand Feature Parade, band competitions, dances, a carnival, a 10K run, and a series of demonstrations by local firefighters. The event is free to attend and a great way to discover this beautiful mountain town near the nation's capital. Unlike in years past, the Flower Mart at the National Cathedral will take place on one day only, May 4, 2018, from 10 a.m. to 6 p.m. Guest can enjoy the grounds of this famed cathedral, browse through dozens of floral displays, take part in family-friendly activities, and enjoy musical entertainment all for free. Local food vendors—including farmers selling herbs, flowers, and produce—will also be on-site, so you won't need to bring a lunch to this event. Taking place all month long each year in May, Passport DC is an event sponsored by Cultural Tourism DC that features a wide range of performances, talks, exhibits, and tours of foreign embassies in the nation's capital. In 2018, Cultural Tourism DC will partner with the Around the World Embassy Tour to showcase embassies from Africa, Asia, Oceania, the Middle East, and the Americas, with artists and artisans, performers, lecturers, teachers, and politicians. 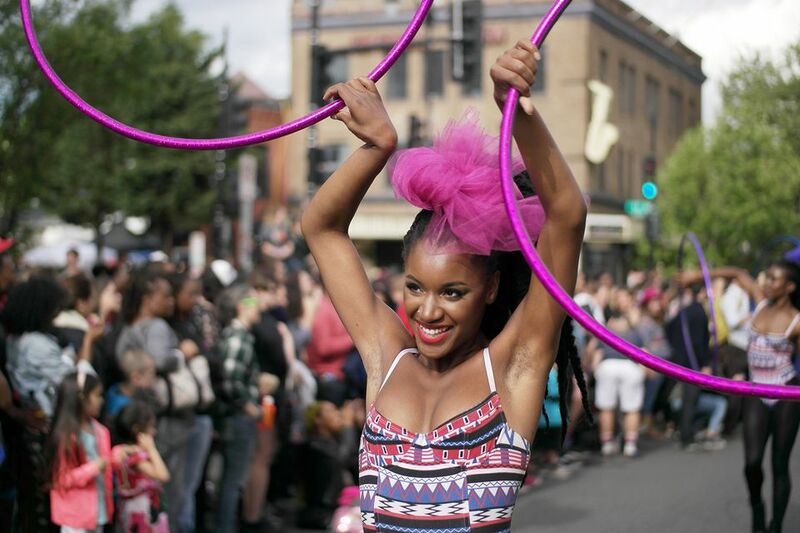 Since 2013, the U Street Corridor of Washington, D.C. has hosted an annual parade and street festival to honor the diverse culture of performance and art in one of the city's liveliest entertainment districts. On May 12, 2018, the Fifth Annual Funk Parade will return to the U Street District with a one-of-a-kind day fair, parade, and music festival. The event also features a costume lounge and "funky costume corps," the Academy of Funk workshops, and the Intergalactic Inter-Generation Station where guests can explore this history of this off-beat music genre. The annual steeplechase in Virginia horse country features horse races, Jack Russell Terrier races, tailgate competitions, and a fancy hat contest at the Great Meadow Polo Club in The Plains, Virginia. The event takes place on May 5, 2018, and starts with a tailgating party before the race. Attendees can reserve tailgating spots on the Member's Hill, North Rail, and South Rail of the Great Meadow, but must register in advance (for free) to enter the Tailgating Contest. There are plenty of opportunities to improve your own health while raising money for worthwhile DC-area charities at the same time. On May 6, 2018, you can participate in the Public Service 5K Walk/Run, which supports civilian federal and postal workers through the Federal Employee Education & Assitance Fund (FEEA), or the 2018 Race for Hope, which supports funding research for brain tumors. On May 12, you can take part in the Semper Fi 5K to raise money for victims of the 9/11 attacks, critically ill and injured members of the U.S. Armed Forces, and their families. Nothing quite says summer in the Capital Region like watching a recent (or classic) film on a large outdoor screen in D.C., Virginia, and Maryland. From D.C. Outdoor Films in Chinatown Park to Movies on the Potomac at the National Harbor in Maryland, there are plenty of chances to catch outdoor films all month long. Movie nights in May typically take place on Fridays and Saturdays, but in June through August, there are many more movie events including on weeknights. Although not as famous for theatre as New York City's Broadway, touring and local productions abound in Washington, D.C. this spring. Coming to the Capital Region in 2018, you can see "The Wiz" at Ford's Theatre until May 12, Cirque du Soleil's "Luzia" until May 13, and "Waitress" at the National Theatre starting May 15, among many others. The Major League Baseball's National League East plays 81 home games each season at Nationals Park Stadium in Washington, D.C. You can enjoy a fun-filled day cheering on the capital's baseball team all month long but be sure to check the official MLB schedule for special events and ticketing before you go. Special events in May 2018 include U.S. Navy Day May 1, Federal Workforce Day May 2, Star Wars Day May 5, and Seniors Stroll the Bases on May 23. The flagship event for Fiesta Asia takes place in Silver Spring, Maryland on May 6, 2018. Celebrate Asian-Pacific American Heritage Month with an Asian street fair featuring live entertainment and interactive displays from 10 a.m. to 6 p.m. The Fiesta Asia Street Fair will also take place on Capitol Hill as part of the Passport DC program on May 19, 2018. This larger street fair includes outdoor food and craft vendors, martial arts and cooking demonstrations, a talent show, and many music and dance performances. Each year since 1928, the Georgetown Garden Club has sponsored guided tours of the area's most exquisite gardens. The 90th Annual Georgetown Garden Tour will take place on May 12, 2018, starting at 31st and O Streets. Included in your ticket, you'll also be treated to an afternoon snack of baked goods and cold beverages at the Keith Hall of Christ Church as well as a self-guided tour of a wide variety of gardens in the neighborhood. If you're visiting the Washington, D.C. area for Mother's Day on May 13, 2018, there are several special events and activities worth checking out to give your mom a special treat. Start the day off right with Mother's Day brunch specials at some of the city's best restaurants, and don't forget to stop for afternoon tea at Tudor Place from 2:30 to 4 p.m. for a special mother-centric service. You can also take a cruise along the Potomac River, a free Mother's Day tour of the Gadsby's Tavern Museum, or go for a hike or picnic in Maryland or Virginia. Starting with the Police Unity Tour Arrival Ceremony at the National Law Enforcement Officers Memorial and the National Police Week 5K on Saturday, May 12, 2018, National Police Week events will take place all week long in Washington, D.C. to honor law officers and their families. Events continue through May 19, 2018, and include a candlelight vigil, a memorial service, and the National Police Survivor's Conference. Featuring over 175 different brews from more than 40 Maryland breweries, the Maryland Craft Beer Festival returns to Carrol Creek Park in Frederick on May 12, 2018. The one-day festival features beer tastings and proceeds from ticket sales benefit the Brewers Association of Maryland, which helps these 40 independent breweries get started and stay afloat. Tickets range from $15 for the designated driver (free for kids under 15) to $55 for a VIP pass that grants early entry and access to limited edition and small-batch brews. You can browse the works of over 140 contemporary artists and enjoy live entertainment, children's activities, and downtown restaurants at the Bethesda Fine Arts Festival on May 12 and 13, 2018. Located in what's known as the Woodmont Triangle in Bethesda, Maryland, this free event features ceramics, clothing, furniture, glass, jewelry, mixed media, paintings, photography, printmaking, sculpture, wood carving, and film all in one place—just 30 minutes from Downton D.C. The Edlavich Jewish Community Center of Washington, D.C. (DCJCC) will present its annual Washington Jewish Film Festival from May 2 to 13, 2018. Each year, the Edlavich DCJCC organizes a series of film screenings, panel discussions with filmmakers, bar crawls and awards presentations. In 2018, the event kicks off with a screening of the documentary "Sammy Davis, Jr.: I Gotta Be Me" and closes with a screening of "The Invisibles." The U.S. Navy's Flight Demonstration Squadron, an elite team of 18 pilots known as the Blue Angels, tour the United States to put on aerial demonstrations of their skills. In 2018, you'll have three chances to catch the Blue Angels perform. From May 18 through 25, the U.S. Naval Academy's Commissioning Week in Annapolis features a USNA campus air show on May 23 and 24 and a graduation flyover of the Navy-Marine Corps Memorial Stadium on May 25. On May 20, 2018, you can enjoy all the best culinary confections that the city of Arlington, Virginia has to offer at the annual Taste of Arlington festival on Wilson Boulevard. This lively street festival also features local entertainment, children's activities, a wine, beer, and spirits area, a "Girls on the Run" 5K run, and Bark Park for your pets. Proceeds from this event go to benefit local charities. The D.C. Dragon Boat Festival returns to Thompson's Boathouse Center with dragon boat races, cultural performances, and hands-on activities along the Potomac River on May 19 and 20, 2018. Now in its 17th year, the dragon boat festival is sponsored by the Taiwan-U.S. Cultural Association (TUSCA) and serves to promote Taiwanese culture in the Capital Region. In 2018, Memorial Day weekend starts on Friday, May 25 and ends Monday, May 28, and the Capitol Region offers dozens of special events to celebrate this federal holiday. Rockville's Hometown Holidays in Maryland is a three-day street festival in celebration of the holiday weekend with music, children's entertainment, and a parade. Alternatively, you could head out to the Delaplane Strawberry Festival at Sky Meadows State Park for the annual festival featuring pony and hay rides, a petting zoo, 5K run, live entertainment, and strawberries. What Events Are There in Washington DC for May 12-14, 2017?